During the late middle ages, the French city of Troyes was a center of Western European conflict. It witnessed the marriage of a French queen to an English king, Joan of Arc’s crusade to liberate France, the Black Death, the arrival of the Gypsies, the birth of Arthurian romance, and more — all before a tremendous fire destroyed the city and its ornate Cathedral, consigning the greatness of Troyes to history. 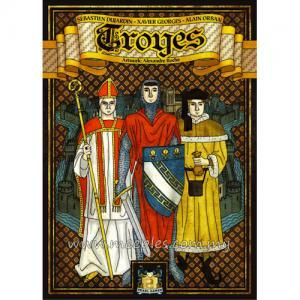 You can experience the greatness of this medieval French city in the board game Troyes. Combining the unpredictability of dice with a tight economy and plentiful player interaction, Troyes challenges you to lead a group of citizens through a tumultuous time and compels you to make tough strategic decisions in every round. Will your citizens become Archers or Artisans? Will you help build the Cathedral, or battle Heresy? Above all, how will you survive the constant attacks, skirmishes, and battles of the Hundred Years War, and earn your family some fame in these tumutluous times? 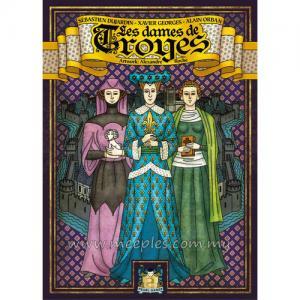 Troyes is also fairly complicated and not for newcomers to the hobby. However if your group of Players thrive on the excitement of rolling dice (and still being able to manipulate the rolls), Player interaction, balancing a national budget of dice/coins/influence and amassing a bucket-load of VPs Euro style, Troyes is one of the few Euro games that manages to unite the Euro genre with dice successfully whilst maintaining an overall theme to create a game that keeps you riveted each turn with many possibilities, in Troyes, there are no bad actions or bad rolls, only how much you can squeeze out of one even if itâ€™s a die with one on it. Is This Game For You? Having played this with my gaming group and hearing comments from other parties, Iâ€™ve come to realize that Troyes is certainly not for everyone despite how great a game I feel Troyes is, particularly those who prefer to have more control over their ability to implement long term strategy or abhor too much Player interference.